President Paul Kagame with Angolan President João Lourenço. 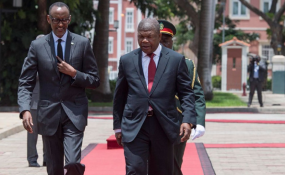 President Paul Kagame on Thursday concluded a two-day working visit to Angola with a news conference in the capital Luanda alongside his Angolan counterpart, President João Lourenço. Kagame said that there were many things that bind Rwanda and Angola together through history, culture and ideologically. The Head of State talked about transformation, saying there was a belief that it can be achieved through investment with and in each other. "In the level of relationship we have developed between Angola and Rwanda, we have looked at areas where we can cooperate and learn from each other, across all sectors," Kagame told the media. "There are no limitations as to what we can do together or how much we can benefit from each other." Kagame arrived in Angola on Tuesday. The visit was expected to serve as an opportunity to strengthen bilateral cooperation between the two nations and existing areas of partnerships, including air transport, security and justice, migration, ICT and governance. Rwanda and Angola have a number of bilateral agreements, including technical advice and information exchange in law enforcement that will see both countries cooperate in security and public order in the interest of their citizens. The agreement was signed this year. The two governments last year signed a Bilateral Air Service Agreement under which RwandAir and Angola's national airline, TAAG, got seven frequencies a week on either side.